160 pages of full color images from the Rio Grande del Norte region of northern New Mexico and southern Colorado. Published by Dog Soldier Press and printed in Canada with a foreword by Taos author John Nichols. 505-501-4880 to use your credit card. In this collection of images, Geraint Smith has given us a view of the Rio Grande del Norte area that is sublime. The view can be subdued and delicately poetic … or truly sensational. The natural beauty of the rivers that flow through spectacular landscapes, inhabited by an abundance of wildlife, is perhaps the common denominator that continues to inspire people who live here as well as those visiting for the first time. Over time things change; often unnoticed are things that remain the same. Transformation happens quickly on the Mesa and compels a close look. Old corrals scattered across the plateau are dilapidated memorials to the large sheep herds that once grazed the Mesa’s grasslands. To see all or any of these magnificent creatures, the intimate details of nature, and the vast landscapes and canyons we share, I encourage you to venture into The Rio Grande del Norte with reverence and wonder. The adventure just might change your life. Breathtaking photographs of the Rio Grande landscape and wildlife reveal an emotional connection that pushes for conservation. In Rio Grande del Norte: An Intimate Portrait, photographer Geraint Smith boldly paints a powerful and colorful portrayal of nearly 240,000 acres of wilderness. Smith’s photographs are often breathtaking as he forcefully drives home the point that this beautiful piece of land needs to be preserved for all to enjoy. The land in question is the Rio Grande Gorge and the surrounding high desert and mountains, located in northern New Mexico and southern Colorado. The Rio Grande del Norte National Monument was designated as such on March 25, 2013, by President Barack Obama, and consists of some of the most spectacular scenery in the lower forty-eight states. Geraint Smith is a photographer who grew up in the coal mining areas in England. He lives in Taos, New Mexico, and has been living in and taking pictures of this area for more than twenty-five years. His knowledge of and love for the Rio Grande del Norte shines through each photograph. Like skilled painters, talented photographers do not merely record images. They study and capture light and its relation to the images presented in their photographs. Smith is very good at this. Some of his photos, such as “Cottonwoods and Sangre de Cristo Mountains,” are startling in their clarity and complexity. It is a simple picture: trees, mountains, and a field. Yet the light is the real focus, and elevates the composition in artistic value. Smith has sprinkled throughout the book brilliant images of the various animals that populate this wilderness. The photographs “Morning Bobcat” and “A Three Coyote Morning” are particularly charming. This book can be enjoyed over and over again; the reader will find something new and stimulating at each sitting. Photographs such as “First Snow” will captivate the viewer. The simple moment reflected here is of a road through the forest disappearing at the horizon. But there is more to it than that—it is an almost mythical entryway of gold, green, and orange, inviting the traveler into a land never before experienced. Smith made the correct choice in letting his photographs tell the story. There is a minimum of accompanying narrative, and the collection is enhanced by a few quotes from environmentalist John Muir. 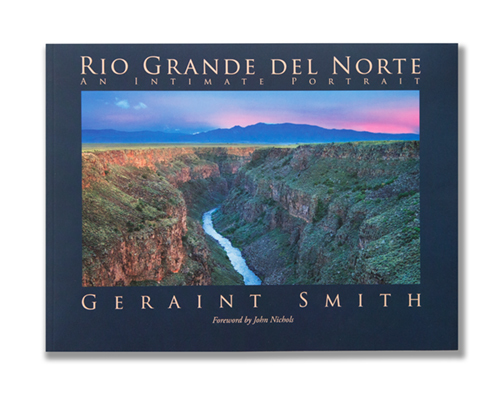 Rio Grande del Norte, in addition to being a wonderful collection of outstanding photographs, will serve as an informative guide to the armchair traveler who may never get an opportunity to visit and experience this beautiful place in person.